The following originally appeared in the February 4, 2010 edition of the Tooele Transcript Bulletin. They came from all over the world. Over 100,000 strong, they braved the wild Chilkoot Trail and the Yukon River in 1897 to reach Canada’s subarctic hinterlands—all because a man named Skookum Jim Mason found gold flakes in a tributary of the Klondike River. Word of the discovery had spread like wildfire through the states, sparking what would come to be known as the Klondike Gold Rush. Interestingly, many of these would-be prospectors weren’t career miners. They were doctors, politicians, and teachers—regular people. Few of them ever struck it rich, but there’s little doubt it was the excursion of all of their lifetimes. The Klondike rush went down in history less for its goal than for its concept—the untamed wilderness, the sleds, the rivalry, the epic procession. It’s no mystery why the Boy Scouts of America adopted the Klondike model for its district-wide winter camps. The organization celebrates its hundredth birthday on February 8. According to the BSA press office, districts have run “Klondike Derbies” annually since at least the 1940’s. The Stansbury foothills are no Yukon, to be sure. But Deseret Peak District’s recent Klondike Derby camp there gave 250 scouts and their leaders a taste of that storied stampede. While snow had been scant on the valley floors that evening, nearly two feet of powder greeted Boy Scout troops at Big Hollow just west of Clover. I knew the camp might get interesting when the snow began to fall. I’ve been to a few Klondike camps in my day and most of them, ironically, have been snow-free. Foggy? Yes. Cold? Always. But snowy? Not since I was 14. This would be an adventure. An adventure for the scouts and scoutmasters, that is. Our troop was attending, but I was there for more opportunistic reasons; I had been asked to help judge the Dutch oven cooking contest. I cooked a can of Spaghettios for my pre-scout age sons Bridger, Weston, and Coulter, before we left that evening. I abstained– no need to spoil a good Dutch oven dinner with city food. There would be 36 scout units in camp, which meant I’d soon get my fill of cast-iron cooked goodness. I grabbed a couple packets of fruit snacks just in case. It’s a good thing I did. When we arrived at the turnoff to Big Hollow, it was obvious something was wrong. 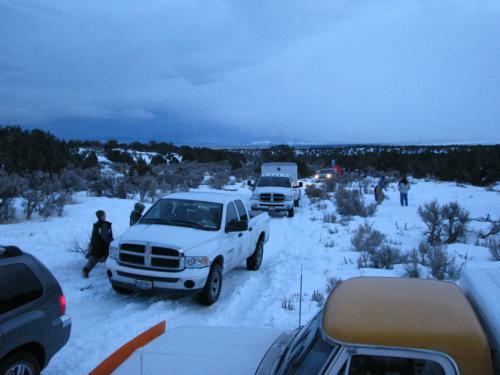 Snow had halted the convoy along the narrow dirt road that led to the hollow, creating a single-file, bumper-to-bumper jam that spanned the road’s entire 1/4 mile length. Subsequent arrivals had pulled into the clearing just off the highway, and latecomers like me parked on the shoulder of SR-199. Snow swirled around us as we made our way up the road. I would find Brownie and leave the boys with him while I looked for my district contacts. Troops were unloading gear from stuck trucks and making camp on the spot. Small campfires lined the road as camp shovels dug platforms and tents went up. The Klondike sleds, which troops build from scratch and use for morning races, were a godsend at this point. Scouts passed me hauling gear via sled up the hill from trucks parked at the bottom. The hustle and bustle reminded me of the old northern boom towns in movies– chaotic but curiously organized. Seasoned leaders and newbies were easiest to spot. Everybody was making do, and spirits were high. We trudged up and down the road in a futile search for our troop. Visibility was hampered by the falling snow. Trucks all looked alike. Bundled scouts were indistinguishable from one another. We stopped to listen, because hearing was the only reliable sense. Most audible voices were those of hungry scouts who admired their makeshift camps and looked forward to dinner. There were some gripes about the weather, but not many. I listened for Brownie. No luck. It was only after wandering around for another half hour that I met him on the road. He and the troop had left their trucks at the bottom and hiked in. I also met my district contact, who informed me that they had diverted 15 units (about 100 people) back north the Mormon Trail and up to Grantsville Reservoir. There was now a “Klondike North” and a “Klondike South.” And as far as he knew, Klondike South’s Dutch oven cook-off wasn’t happening. I reached for my fruit snacks. Brownie offered me a hot dog and a roasting stick. We helped pitch another tent while the scouts showed Bridger, Weston, and Coulter the art of falling backward into the snow. When it was time to pull out, I made one more walk up the road. The little camps were quiet now. Most scouts still sat around fire rings or were settling into bed. A few stalwart troops were nursing Dutch ovens. District Chairman John Poulson briefed me later on the activities up at Klondike North, which was able to set up quickly and hold a downscaled Dutch oven cook-off. In the morning they held a formal flag ceremony, sled races, knot tying and first aid relays, and a fire building contest. Klondike South eventually held their Dutch oven cook-off. The snow situation there limited morning activities to the sled race, in which scouts pushed their sleds on a set course. Leaders then worked to pull their trucks from snow banks. The Stansbury foothills aren’t the Yukon. But for those scouts that weekend, they might as well have been.